I’ve knit the body to pattern, but I have a lot of yarn left. I think I’m going to attempt to put in another stockinette section and another garter eyelet row before binding off. I might be playing yarn chicken so fingers crossed I have enough! 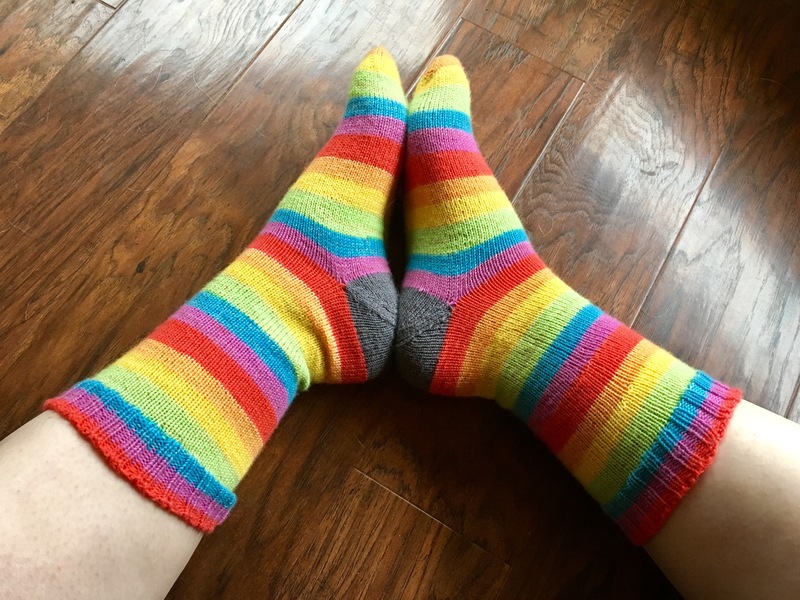 Tah Dah….my tonsil recovery knitting project is done! They are just so bright and happy! And they match *almost* perfectly. 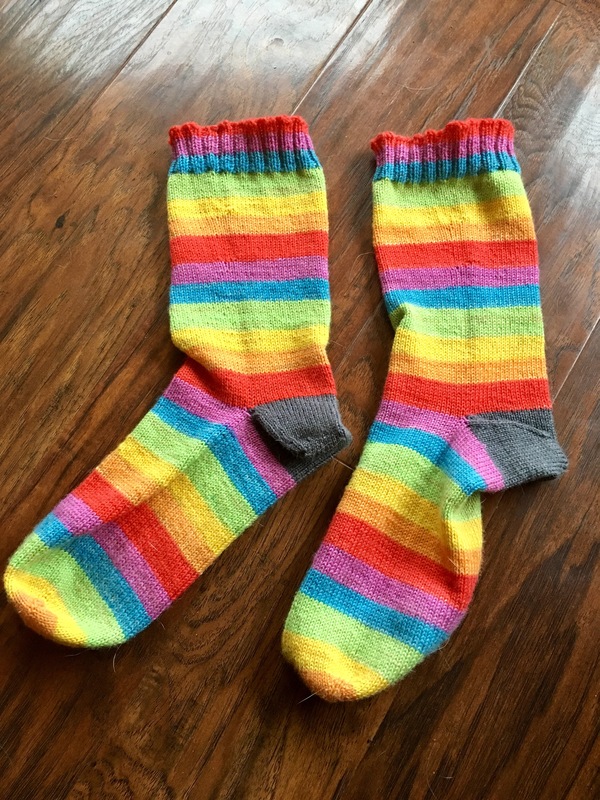 I used Knit Picks Felici in Rainbow on size 0 US needles. 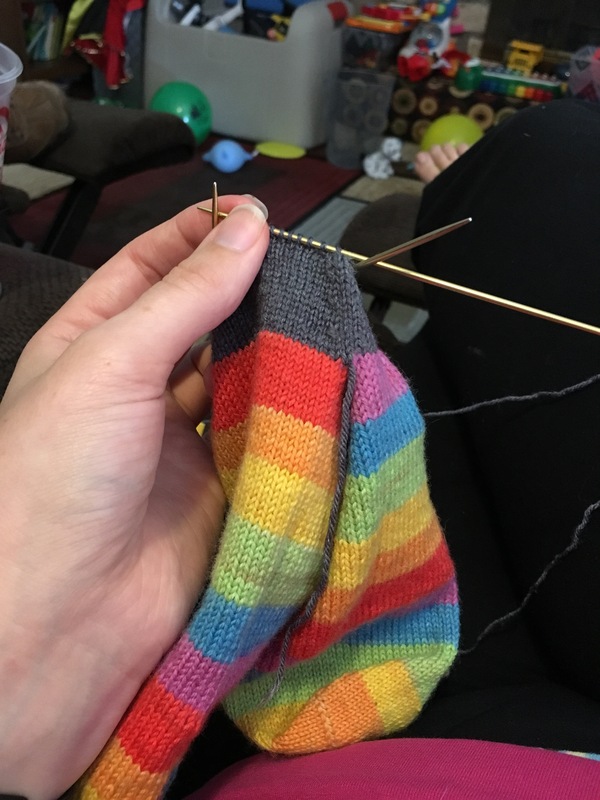 The pattern is just a 72 stitch vanilla toe up sock. I put in an afterthought heel in a contrasting color. I thought the grey suited nicely. 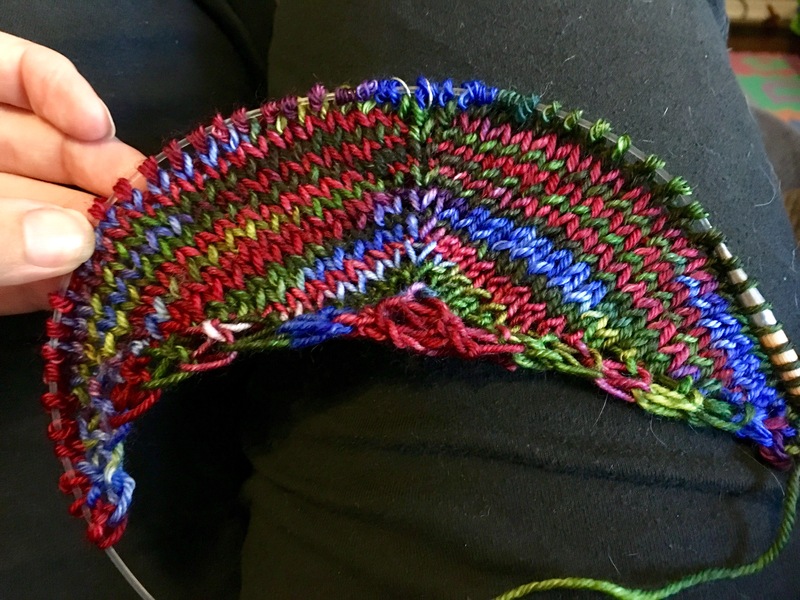 I used about 340 yards of rainbow and 20 some yards of the grey. 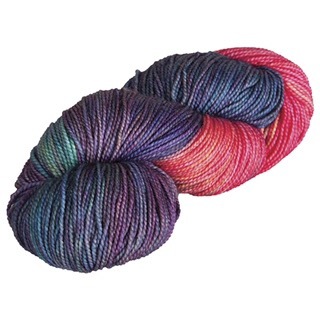 And it was awesome pick up/set down stockinette knitting when I didn’t feel great. I turned these in for points in both the Down Cellar Studio’s Pigskin Party KAL and the Carolina Fiber Girls’ Socktober KAL. I feel very accomplished given how crappy I felt! I cast on during my tonsillectomy recovery. I’m loving it so far! My garter tab cast needs some work but I’m happy enough, lol. 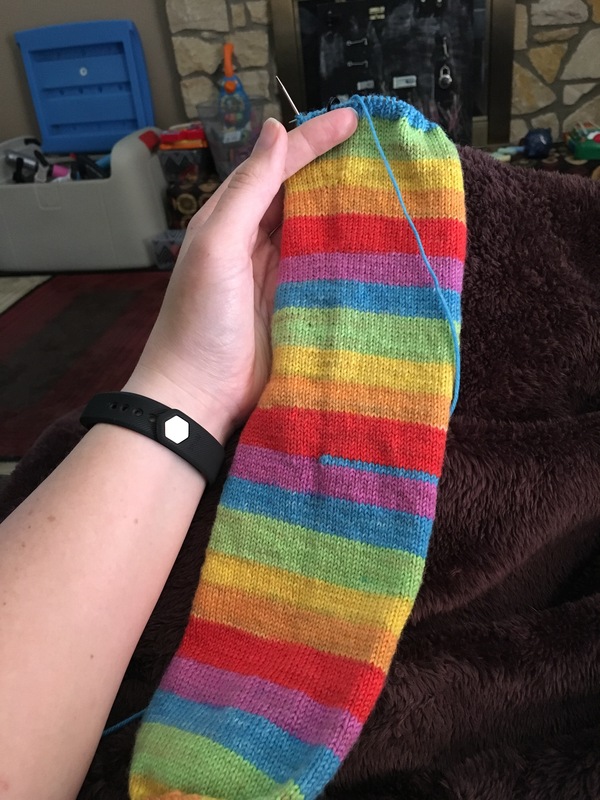 I did end up using size 9 US needles when the pattern states 8s. But the fabric it’s making isn’t terrible so I don’t feel inclined to rip it out and start over. 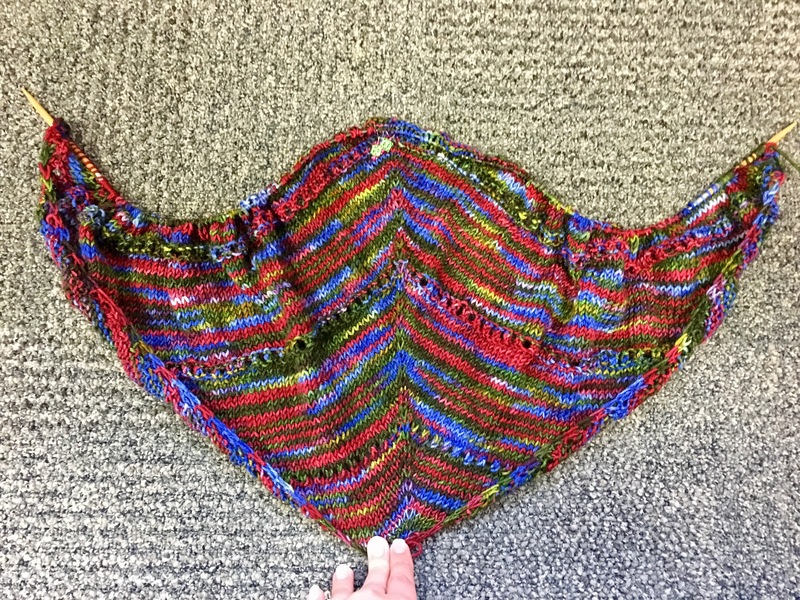 I am just going to have a slightly bigger shawl, no biggie! 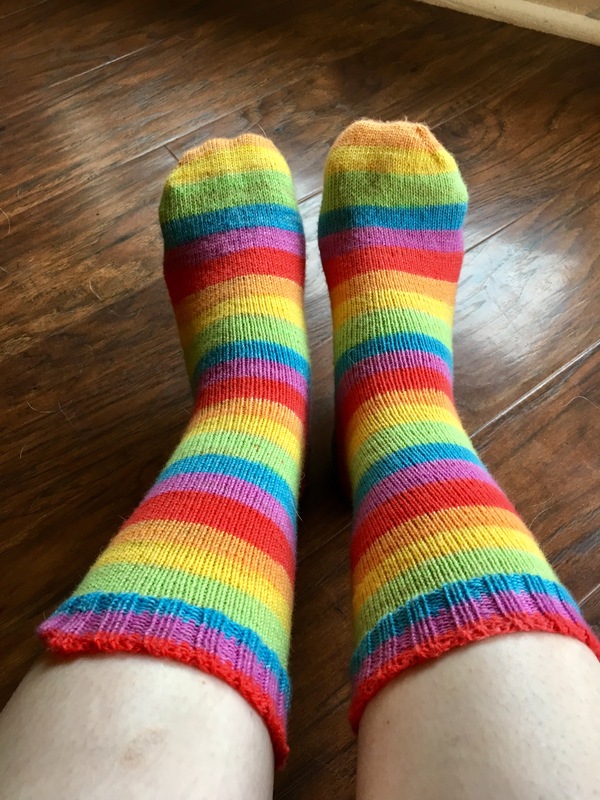 While I was doing my post-op recovery after my tonsils I focused on my Rainbow Brite Socks both because it’s #socktober and because they were soothing stockinette. Then I had a rough day and took a break. Around day +5 I made some progress again. Sock one was done with the “tube” and I had a good jump on sock two. Then I had a REALLY bad couple of days around days +8/9. And I took another break. They are done now and I’m hoping to get some photos taken for FO Friday this week. My sister was here to help with Jellybean during my tonsillectomy recovery. 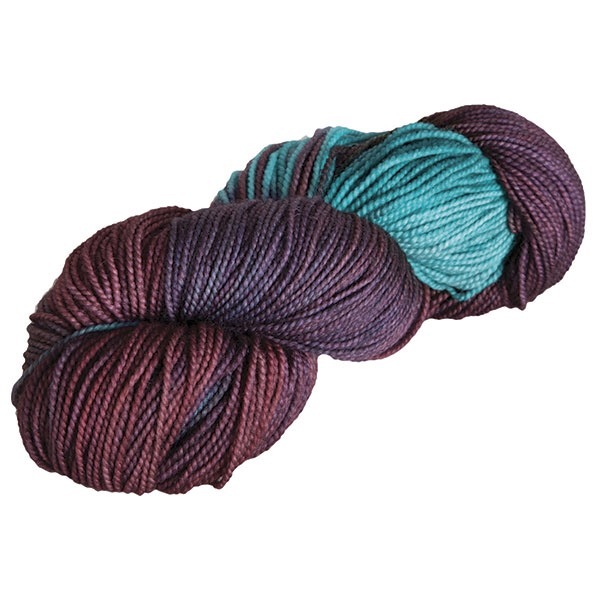 While she was here she wanted me to pick out my birthday present so of course I chose yarn! 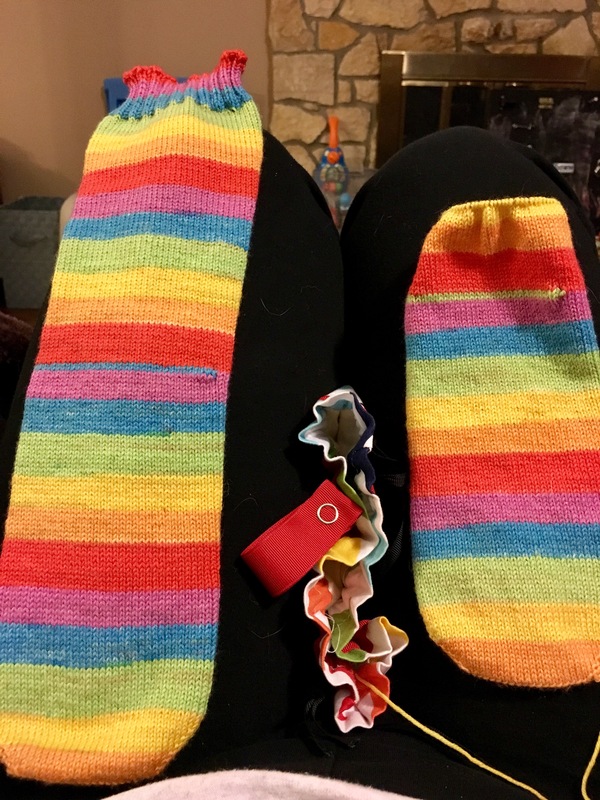 I knew I needed some more Knit Picks mighty stitch to finish my Might Rainbow Blanket since I stole yarn to make the Jayne Hat. 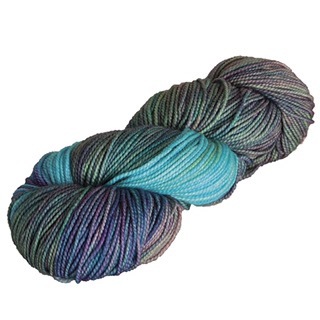 So I threw those skeins in there and my sister helped me pick birthday yarn! 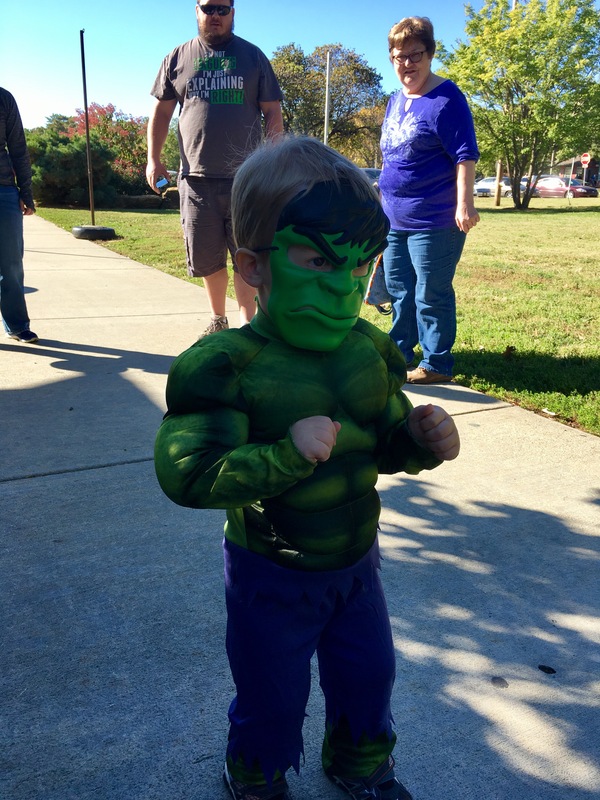 We settled on something new to me…Hawthorne Sport Multi! We chose Vancouver, Happy Valley, and Buckman. I’m back to the working grind today. I wouldn’t say I had “fun” while I was off work but it was nice to knit and nap all day in between medicine doses. 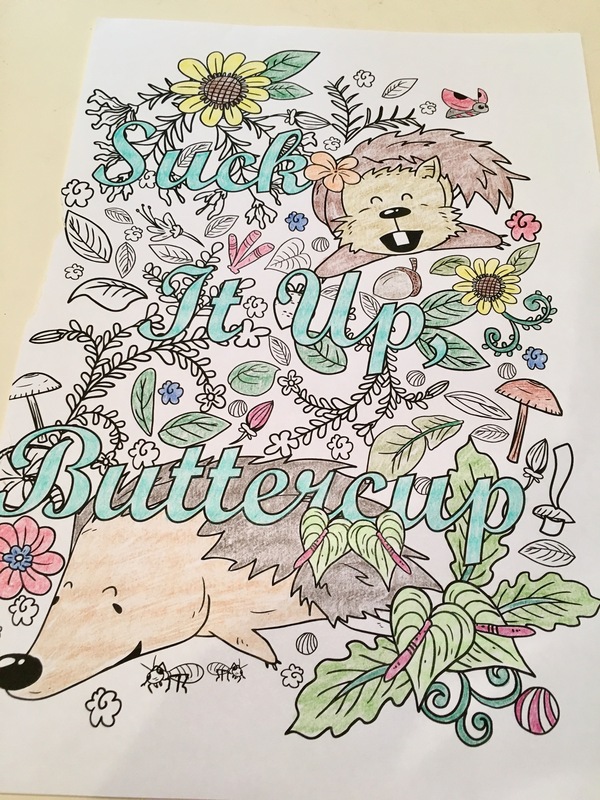 I Never Thought I’d Say This….Coloring Is Fun! This was sooo zen and fun. Even Jellybean sat down with me and did some coloring in his Ninja Turtles coloring book! 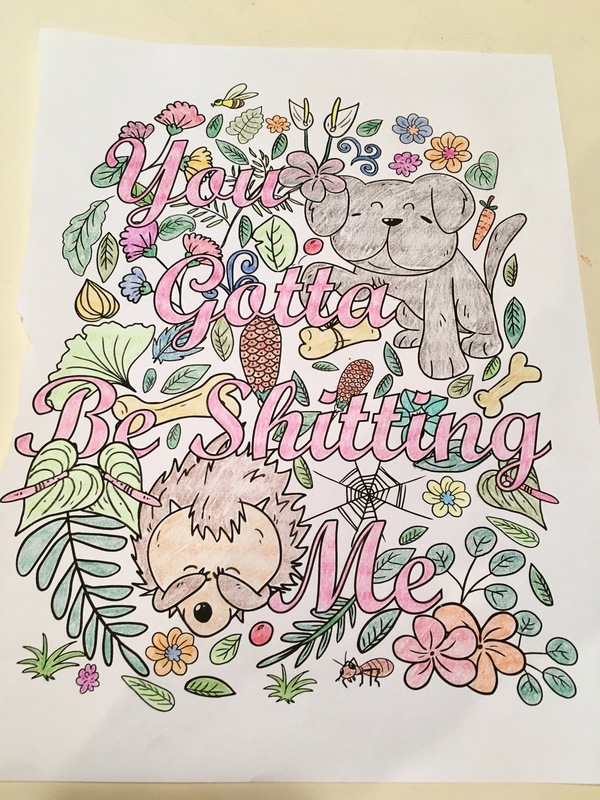 I feel like there will be more coloring in our family future! And I never thought I would jump on this bandwagon….but here I go! My BFF from college sent me a care package for my surgery recovery. She is the best and completely understands what it takes to make me smile! 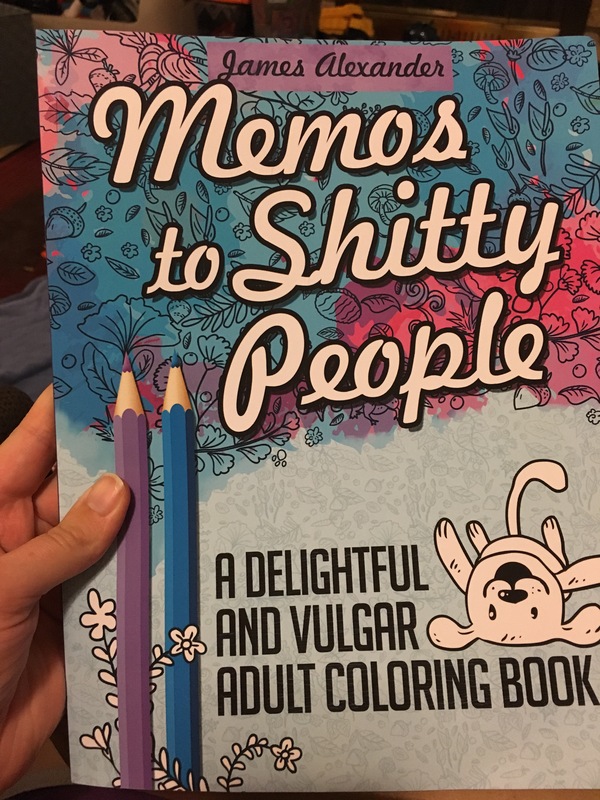 This coloring book is so ‘colorful’ that I literally can’t show you the inside. But use your imagination and trust that what’s inside is way worse! It may be the narcotics but this book makes me giggle and forget about the pain. I’ve made some progress on my Mighty Rainbow Blanket. 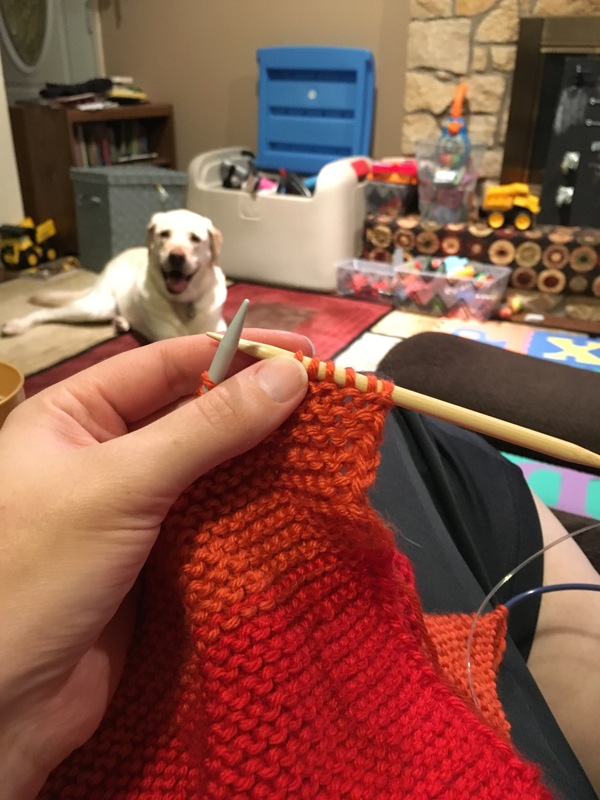 I’m almost through the second skein, orange. But my old faithful Denise interchangeables just can’t keep up as this blanket gets heavier and heavier. The cable joins just keeping coming unsnapped and I’m too much in pain and foggy to deal with picked up stitches. So I had the hubby run out and picked up some Hiya Hiya wooden 29 inch circ. He’s a good husband!